My inspiration for Shawn came from seeing an onset of teenage unhappiness in people close to me, and the damaging impact of a ‘man up’ culture which isolates vulnerable people with their burdens. We wanted to show these dynamics as they occur in real life, within the hyper-masculine environment of a dingy barbershop. The first step was finding a barbershop which communicated a feeling of claustrophobia, somewhere which felt void of colour and anything warm. We found this in a basement below a working barbershop in Shoreditch, and immediately knew we had found the right space with it’s sense of grit and it’s barebones aesthetic. This was my first project in which I have worked with a crew and professional actors. It took a bit of time to learn how to communicate my vision to a crew, but eventually I hit my stride. This occurred when we sat in a circle and talked about our own experiences of anxiety and sometimes feeling disconnected to people around you. 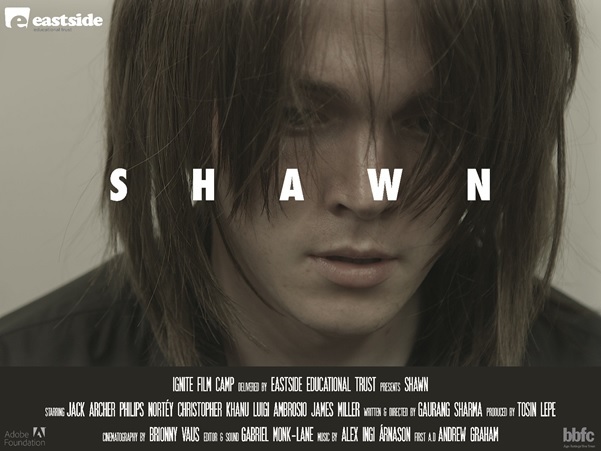 By finding common ground with the cast and crew, we soon got on the same page about what we were trying to create here, and got the ball rolling in getting people to share their issues and anxieties, like Shawn eventually manages to do in the film, and feels a whole lot better for it. The haircut itself became a real challenge, in terms of how we would approach the issue of continuity. We decided to make a last minute change to a emotive haircutting montage, in which we could control the continuity better. This actually became a real strength of the film which blossomed from a problem we had to find a solution to. I feel we captured some great emotion through the combination of the music and acting on screen, the facial expressions speak louder than any words we could have used. Gaurang Sharma is a creative skill set floor runner, as well as a director of short films. You can follow his projects on Twitter.